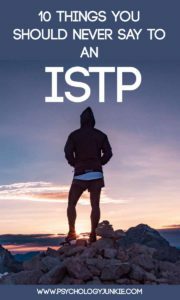 In the personality community, ISTPs are one of the least-discussed types out there. It’s a sad thing too, because they are one of the more mysterious and fascinating types you’ll come across. At first glance they can seem rather stoic or reserved, so it can be difficult to know what types of conversation spark their interest and what things should absolutely never be said. After speaking with over 100 ISTPs, I decided to put together this post with the major things they HATED hearing in conversation. This statement came up repeatedly among the ISTPs I spoke to. They aren’t usually the most expressive people, but that doesn’t mean they aren’t having a good time or enjoying your company. Being told to “lighten up” or to smile more are all things that tend to frustrate them. Complaining. ISTPs don’t see the point in it unless you have a really good reason to tell someone or a specific solution you need. For example, “Ouch! I just got hit by a car! I need an ambulance!”….see? Severe problem and a practical reason for telling someone about it! Really? Do you? Regardless of what you think you know, interruptions are never cool with ISTPs. They aren’t long-winded people and when they do speak they are usually pretty concise and careful with what they say. It’s important to listen and be attentive when they decide to share their thoughts. If you really want to get on an ISTP’s nerves, be an obnoxious driver. Merge slowly, forget your turn signals, and pass people as slowly as possible. ISTPs need to look at all the options and all the information before they make a decision. They hate feeling rushed to make up their mind on the spot, and people who pressure them to do so are likely to be labeled as overbearing and annoying. Don’t be one of those people! ISTPs can be very caring, generous people, but when they make a decision they want to be objective. Stepping outside of personal feelings helps them to remain unbiased, logical, and fair. Making emotional appeals and putting down their process for deciding isn’t usually the best way to go about things. Life is full of options to the ISTP. They see what they’ve got and try to make the most of it, and their resourcefulness is one of their greatest strengths. People who blame all their problems on other people without trying to “make lemons out of lemonade” tend to get on their nerves. Beating around the bush drives ISTPs crazy. They like to know accurate details, but they want people to get to the point and be as concise as possible unless the story they’re telling is really that fascinating. So choose your words and try not to ramble too much! ISTPs hate feeling restricted or controlled. Over-scheduling their time or limiting their ability to act spontaneously will almost certainly backfire. They like to have plenty of unstructured space to pursue their own interests and activities. ISTPs tend to get in hot water with more rule-oriented types because they like to improvise rather than follow a pre-ordained set of rules. They will often eschew manuals in favor of figuring out how something works with their own hands. Having someone shadowing them and critiquing their every move will make their blood boil. They prefer space to figure things out solutions their own way. They’re pretty good at finding unique and out-of-the-box solutions to problems! What things do you hate to hear in conversation? What things do you LOVE to talk about? Share your thoughts in the comments!